When math and baking come together and pretzels and peanut butter are involved, this is what the equation looks like: pb + pretzels [crushed] √ (35°/30 minutes) x melted chocolate = truffles. This truffle is dessert simplicity at its best. Only three ingredients – pretzels, peanut butter, and chocolate – come together in a form so exquisite, it is the pinnacle of salty, sweet bliss. Begin by crushing a few handfuls of pretzels. You can do this in a food processor but that is just another thing to clean. Instead, I busted out my rolling pin and crossed my fingers that my neighbors were not trying to sleep. 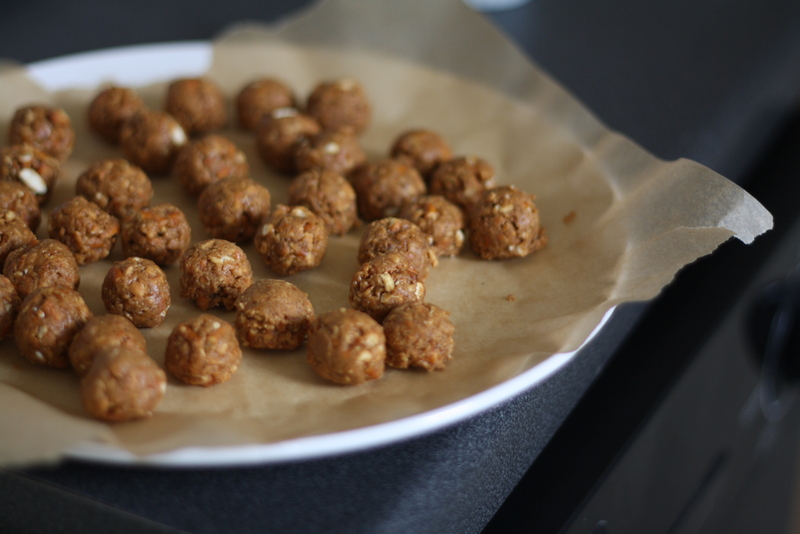 Next step: mix in peanut butter and roll into balls. Now things start to get difficult because you have all these peanut butter and pretzel centers that will you want to “sample” but resist. They turn into something even more magical when dipped in chocolate. Patience is a tricky friend. Chop up some chocolate and melt it down. I used a 72% dark chocolate bar. 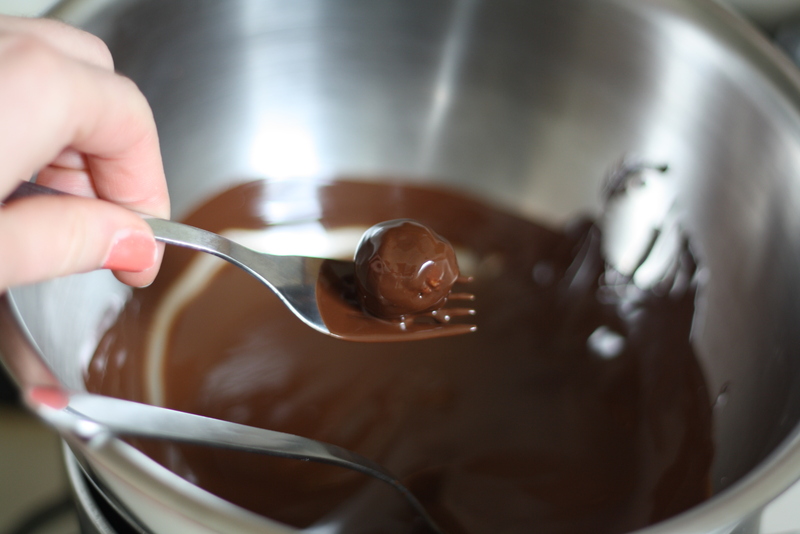 Use a spoon to roll the center around in the melted chocolate until it is fully covered. Then use a fork to lift out the covered ball and gently tap your fork against the side of the bowl to remove any extra chocolate. 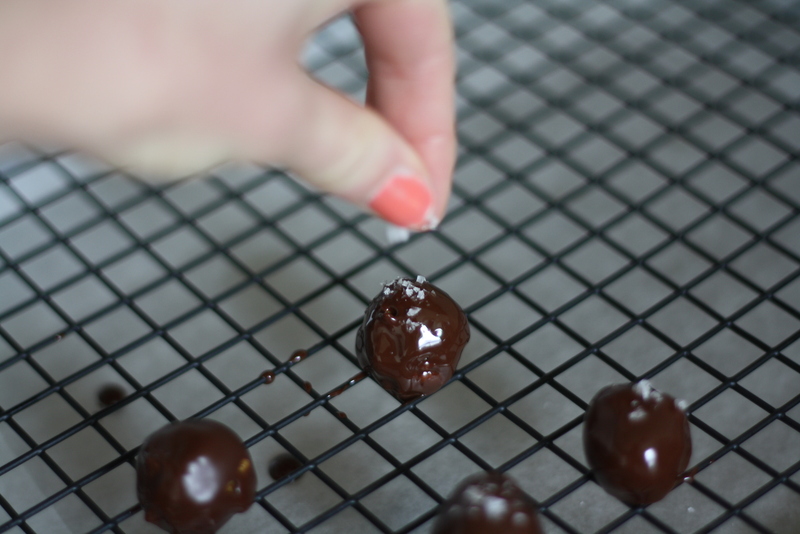 Sprinkle each truffle with a pinch of flaky salt. This looks fancy but tastes even better. It is amazing what a pinch of salt will do yah. 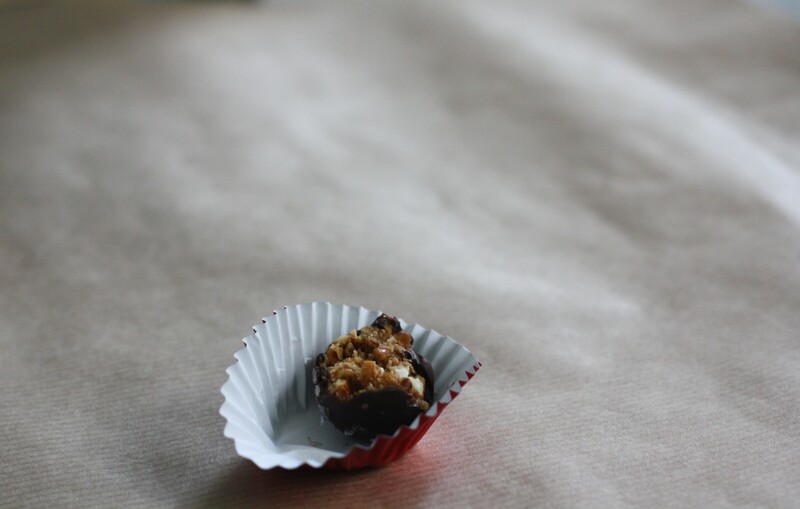 When the chocolate has set, dress up each truffle in a tiny paper cup coat. This is the candy world equivalent of wearing black tie which is perfect because there happens to be fancy black tie party going on tomorrow in Los Angeles. Are you going to an Oscars party tomorrow and need a classy but easy last-minute dessert? I think you may have just found it. There are two ways to approach this recipe, the short version and the long version. Here is the short version: Mix the peanut butter and crushed pretzels together, chill, roll into small balls, dip in melted chocolate, and sprinkle with salt. “Test” at least seven and bring the leftovers to whichever party you are going to this weekend. Here is the long version: In a medium bowl mix together the peanut butter and crushed pretzels until combined. Refrigerate the mixture until firm, least 30 minutes, and up to several days. 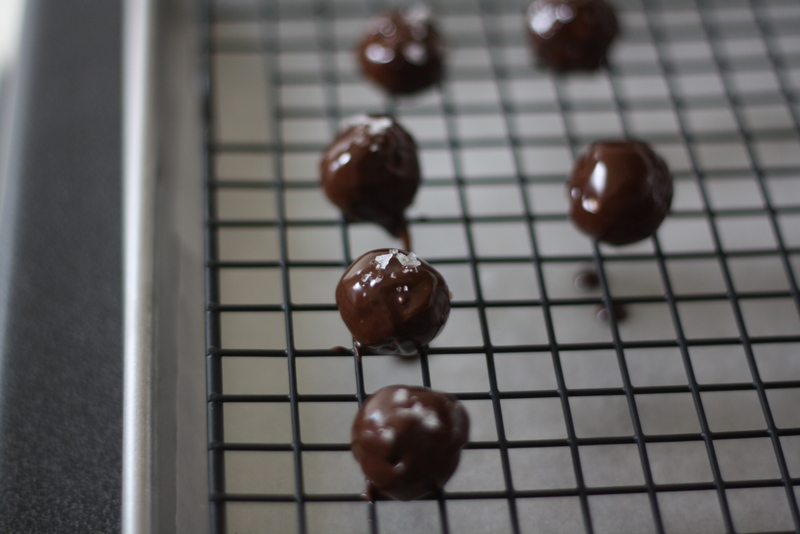 When you are ready to shape into balls, line a baking sheet with parchment. 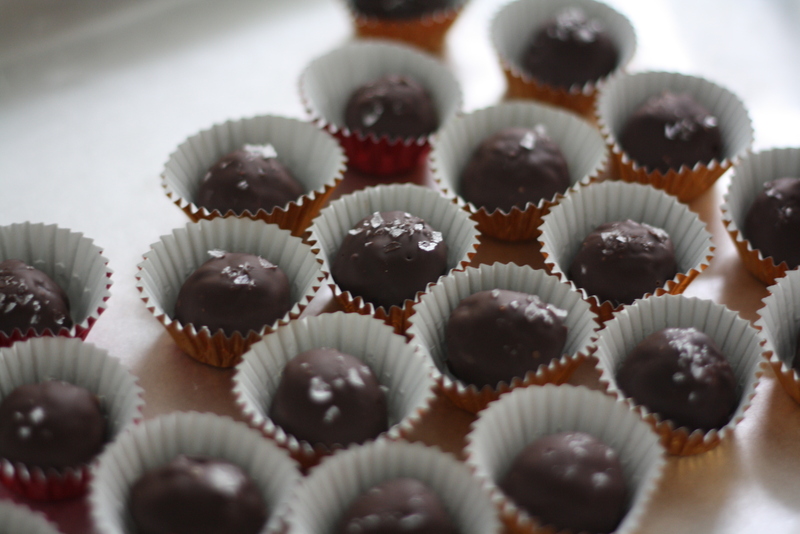 Use a teaspoon to portion out the mixture and roll into balls. Refrigerate the balls for 30 minutes or until firm. Meanwhile, melt the chocolate in a heatproof bowl set over barely simmering water. Place a wire rack over a waxed paper-lined baking sheet. 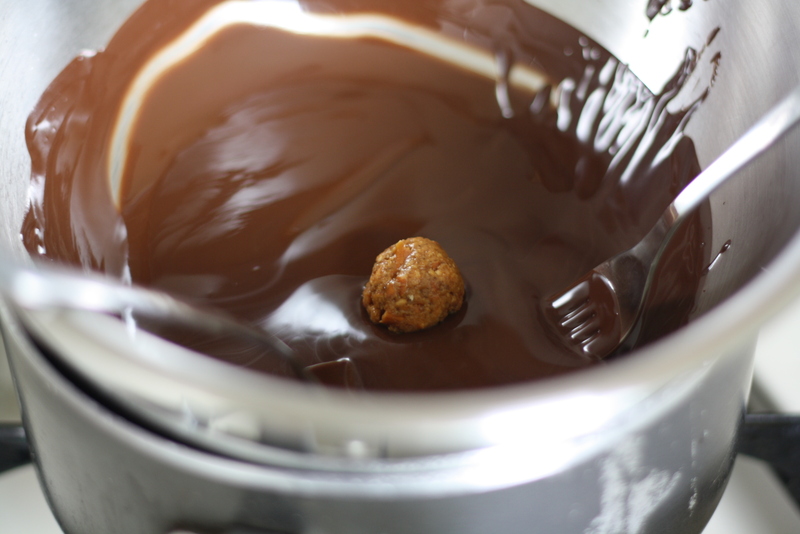 Working one ball at a time, drop a center into the melted chocolate and use a spoon to roll it around until it is covered in melted chocolate, then use a fork to lift it out and let the extra chocolate drip off. Place the coated ball on the rack while you dip the remaining balls. Repeat the dipping process until all the centers have been coated. 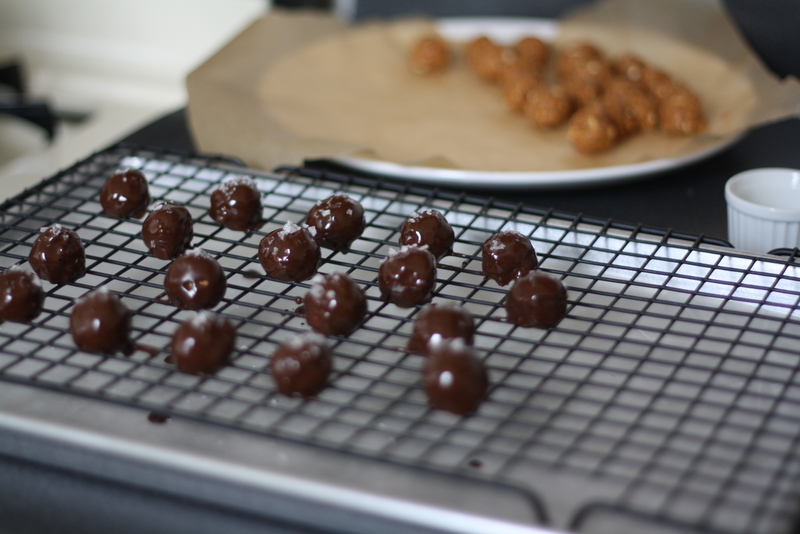 Use an offset spatula or spoon to gently transfer the balls from the rack onto the waxed paper-lined baking sheet. If you let the balls set up on the rack, the bottoms will stay behind when you try and remove them. Sadly, I know this from experience. Sprinkle each truffle with a pinch of flaky salt if using, and refrigerate for an hour or until the chocolate coating has set. 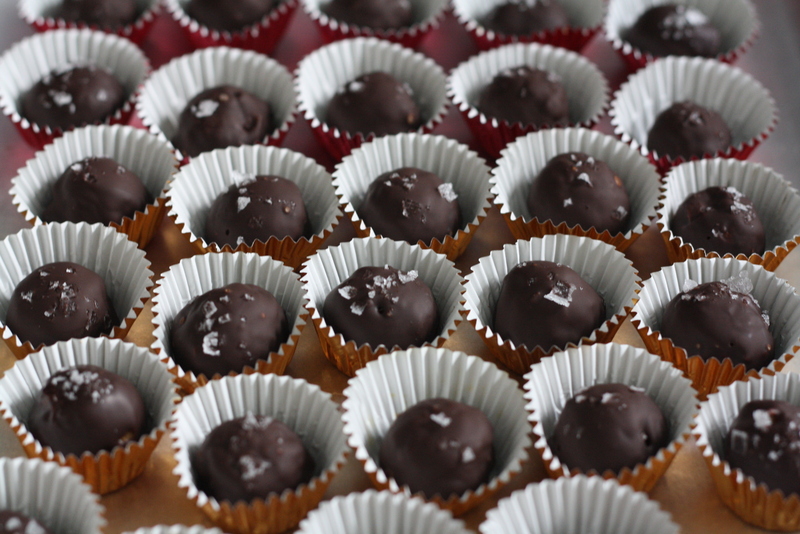 Place each truffle in a small candy cup because your mother was right when she said it is all in the presentation. Serve chilled or at room temperature. This. Looks. Amazing. Thank you for sharing! Chocolate and peanut butter is the best possible combination of anything, and adding pretzels in??? Wow. Can’t wait to try this. I have been super drawn to simple sweets lately, and these are no exception. They sound so good! I know I’d get addicted to these because you can’t go wrong with that flavor combination! Wow – these are great step by step photos. You have made me want to eat these suckas like it’s nobody’s business amazing! Lilly, I really like this recipe! For me as a non-American it seems really fancy, exotic, and so American mixing pretzels with peanut butter AND chocolate. And therefore I’ll have to try these! I always enjoy your pictures and recipes and I’m looking forward to your next post! Do you prefer any special brand of peanut butter, which is THE one and which tastes better than the rest? These truffles look so delicious! Anything with peanut butter is an automatic winner in my book. I reposted your recipe on my blog http://www.igniteyourbite.com. Oh, Lillie! These take chocolate covered pretzels to a whole new level. I know just the salty-sweet lover that I am going to make these for. Thanks! I love mixing salty with sweet when baking. I would have to agree that resisting the temptation to “sample” too many of these truffles while making them would be difficult. It looks just as fun making them as eating them! Ugh this is all of my favorite things at once. 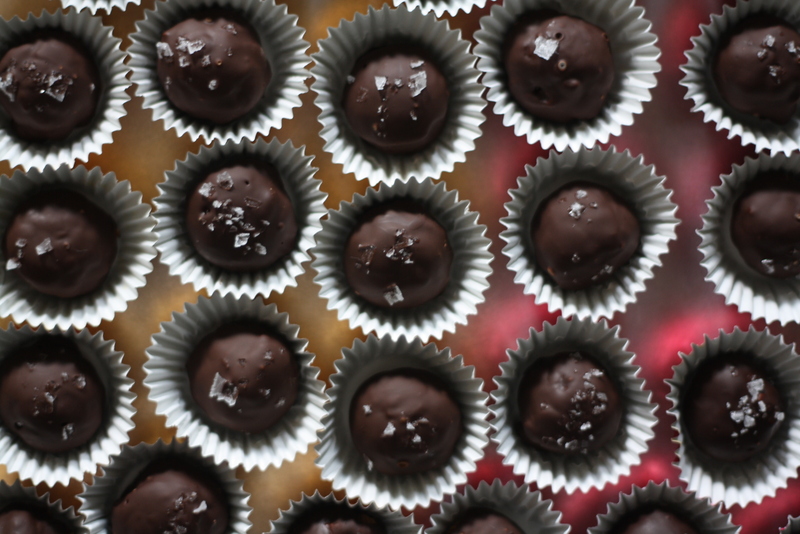 Sweet and salty truffles are the best! Yours look pretty easy too. The Oscars might be over but there must be some upcoming party I can bring them too! I really like this recipe. They look delicious. I will try to make this recipe. Can you make these ahead of time and/or can you make and freeze them? Hi Lori – the centers can be made ahead of time and then dipped the day (or a few hours) before you serve them. I haven’t tried freezing them, but if you do, I’d love to hear if they hold up.